The secret to choosing a tree for a smaller property is to make sure you know all its characteristics before buying it. Find out the eventual height of the tree and the spread of its leaf canopy. Make sure it does not have intrusive roots and will not grow too large so that it intrudes over into the neighbour’s yard or crowds out your small garden. If your garden is very small, it might be best to choose a deciduous tree that will lose its leaves in winter, thus allowing your home to receive much-needed winter sun for warmth in the colder months. A small evergreen tree might be ideal for providing privacy for your garden from neighbouring upstairs’ windows. In small gardens, it is a good idea to prune the lower branches of trees as they grow to allow more light into the garden or house. Trees play a vital role in reducing your carbon footprint. How do they do this? Trees absorb carbon dioxide from the atmosphere – through the process of photosynthesis, the carbon is converted into carbohydrates for the tree’s growth, and the oxygen is released back into the atmosphere. Studies have shown that over a period of about 15 years, approximately 500kg of carbon is ‘stored’ per tree. Life is a garden planted up with eco-friendly trees, so make your contribution to greening your environment this spring and plant a tree! This deciduous tree grows to a height and spread of 7m x 4m. 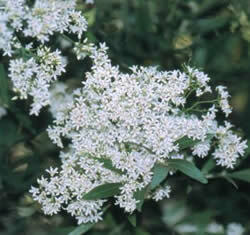 It has a slender, erect shape with an attractive bark and bears masses of lilac-blue flowers in spring. A fast-growing evergreen tree with a height and spread of 5m x 3m. 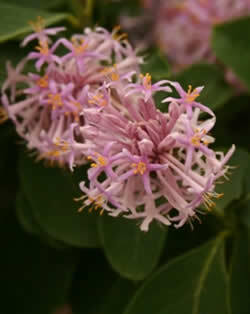 It bears pretty pink flowers in summer and yellow foliage in autumn. A very hardy evergreen tree with an interesting trunk and branch growth patterns. It has a height and spread of 7m x 5m with long, narrow, weeping leaves. 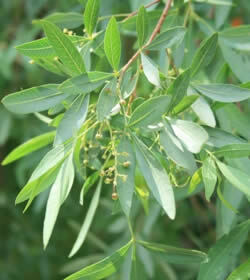 A water wise, evergreen tree with pretty, willow-like foliage. Its height and spread is 7m x 5m. It bears light green leaves and sprays of tiny greenish-yellow flowers. This evergreen tree thrives in warmer areas. It has a compact shape and grows to 5m x 4m. New spring foliage is red and is followed by attractive flowers and fruit in summer. A deciduous tree which grows up to 6m high and 5m wide. Its foliage emits a sweet lavender scent when crushed. It has attractive bark that starts off smooth and white and becomes grey and flaky with age, revealing patches of orange-brown bark beneath. New spring growth is tinged red, becoming glossy green in summer before turning autumn shades. This evergreen tree grows to 2,5m high and 1,5m wide. It bears highly fragrant white flowers in midsummer. The foliage is shiny and crinkled. A deciduous tree with a height and spread of 7m x 4m. It bears beautiful autumn foliage and its dense canopy makes it a great shade tree. A deciduous tree up to 6m high. Bears clusters of white flowers in spring. This semi-deciduous, water wise tree can reach about 30m in height. It bears cream-coloured flowers in early spring which are relished by bees and birds, and it is a host plant for a number of butterflies. Once established it tolerates moderate frost. This tree is regarded as one of the best trees for attracting birds to your garden. Both its flowers and fruits are a bird favourite, whilst butterflies also love the flowers’ nectar. It is an evergreen tree which quickly reaches a height of 4m. It tolerates moderate frost and some shade. This deciduous tree reaches a height of about 12m with a widely spreading crown. In spring, its golden-yellow flowers attract birds, bees and other insects. In winter the bare branches carry spiky circular pods. It tolerates mild frost and is water wise.